Line from the film: "One of my race crossed the Danube and destroyed the Turkish host"
Billed as the most faithful adaptation of Bram Stoker’s classic novel, director Jess Franco’s Count Dracula features an all-star cast led by Sir Christopher Lee, reprising the role he made popular in countless Hammer horror films, yet playing a much different Count than he ever did before. Acting on behalf of his employer, Jonathan Harker (Fred Williams) travels to Transylvania to meet with Count Dracula (Lee) and discuss the nobleman’s recent purchase of an estate in England. Ignoring the warnings of the locals, Harker makes his way to Castle Dracula, only to discover that the Count is, in fact, a vampire who intends to kill him. Following a daring escape, the frightened young man eventually ends up back to England, so shaken by his experiences in Transylvania that he’s committed to the sanitarium of Dr. Sewell (Paul Muller), where, for several weeks, he drifts in and out of consciousness. It’s during his time here that Harker meets Van Helsing (Herbert Lom), a medical man who also dabbles in the black arts. Though initially skeptical of Harker’s claims that a vampire has moved to London, Van Helsing and the others soon realize the truth when Harker’s fiancée Mina (Maria Rohm) and her best friend Lucy (Soledad Miranda) pay a visit to the sanitarium. Having fallen under Dracula’s spell, Lucy is slowly drained of her blood, pushing her to the brink of death. Aided by Harker as well as Lucy’s fiancé Quincey (Jack Taylor), Van Helsing attempts to destroy Dracula, hoping to do so before he Count can sink his teeth into more innocent victims. 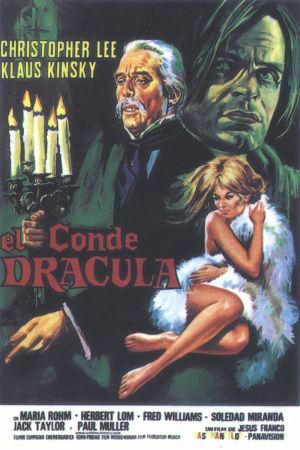 Shot in actual locations across Spain and Germany, Count Dracula definitely has an old-world feel to it, yet the film’s greatest asset is its cast. Herbert Lom, best known as Chief Inspector Dreyfus in the Pink Panther series, does a fine job as Dracula’s arch-nemesis Van Helsing, a man who, though slow to act, knows how to defeat the dreaded Count, In addition, Count Dracula features the beautiful Soledad Miranda (as the doomed Lucy) and the great Klaus Kinski (playing a mute version of Renfield). Topping off this impressive group is Christopher Lee as Dracula himself, a role he had been playing since 1957 (the year Horror of Dracula was released). But unlike the Hammer films, this Dracula starts as an older man, gradually growing younger as the movie progresses (each new victim shaves years off his appearance). Count Dracula also afforded Lee an opportunity to deliver dialogue lifted straight from Bram Stoker’s novel; the scene where Dracula tells Harker about his family’s proud history, only to add that he’s grown “restless” in Transylvania and is looking for a change of scenery, is a definite highlight . And even though Dracula himself doesn’t show up all that often, Lee makes the most of each and every one of his scenes. Though slower paced than your average vampire film, Count Dracula is nonetheless a fascinating take on a time-honored tale, delivering a version of the story that Stoker himself would likely enjoy.